Famed British entrepreneur Sir Richard Branson, founder of the Virgin Group of companies, was on hand at E3 in Los Angeles this week to launch his latest business venture in the games market. 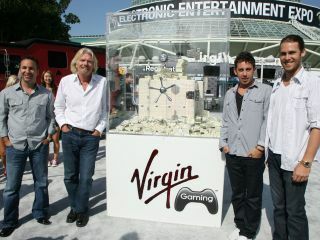 Branson unveiled the new Virgin Gaming company, which is set to be a competitive online portal for PlayStation and Xbox 360 gamers looking to make a bit of cash from their hobby. Branson's new Virgin Gaming website will let console gamers organise competitive matches and take part in official Virgin Gaming tournaments. "Gamers want something new, something interactive and something fun. Virgin Gaming is just that – access to play the best games in super competitive tournaments with anyone in the world and win the biggest prizes and the most rewards," said Branson, promising a $1-million prize fund for gamers in the first year of the service. Branson adds: "We've had great success with Virgin Games and Virgin Interactive Entertainment and recognized the enormous potential of an online community of 40 million daily users. I welcome gamers from novice to expert to join the online Virgin Gaming community." Virgin Gaming will let players upload their Xbox Live gamertags and PSN IDs, organize competitive matches and participate in cash-prize-winning tournaments, the results of which will be verified through the site. "Built on a pioneering online gaming platform, Virgin Gaming enables gamers of all skill levels from around the world to meet, challenge and play each other in head to head matches and tournaments for cash, points and prizes," promises Mr Branson's press release. You can head over to Virgin Gaming if the idea of making cash from playing games competitively appeals to you.